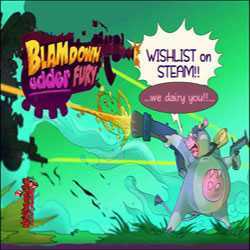 Blamdown Udder Fury is an Action and Adventure game for PC published by Guru Games in 2016. Can you control a cow with a bazooka!? She wants to make a big revenge on the cruel people with the special weapons. But the enemies are much more than what she thinks in the city.